Like CO2 carbon monoxide emissions arise from the combustion of fossil fuel. CO2 comes from complete oxidation of the carbon in the fuel and CO results from incomplete combustion of the fuel due to local areas with shortage of air supply. In a normal compression ignition engine the excess air ratio is larger than 1 and thus the CO emission is generally low. Theoretically, if > 1 combustion will be complete and no CO will be formed. In practice this is not the case, and there is always CO present in the exhaust gas because there will be local areas with insufficient air supply to facilitate complete combustion. 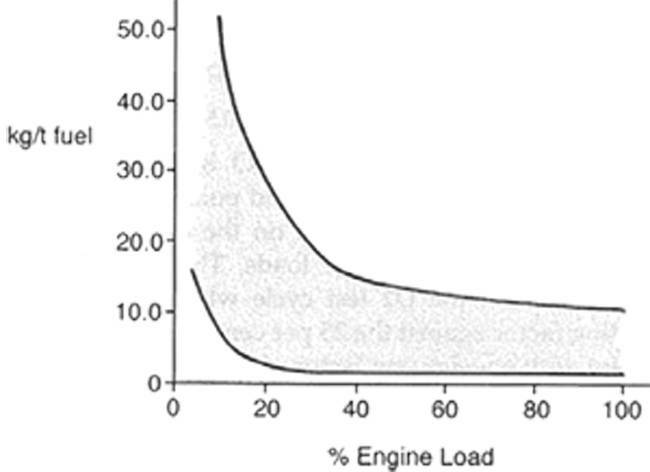 The CO emissions vary with engine load and for higher loads they are more or less constant as show in figure 44. Even though CO emissions from compression ignition engines are normally low they can be significantly higher at low loads or when idling. Here the fuel air mixture is often over rich and the temperature is relatively low which results in incomplete combustion. Accidental after injection of fuel or nozzle drip can also cause CO formation. CO is toxic and can be very harmful to humans. It is colorless and odorless, tasteless and has caused many deaths both intended and unintended. CO is naturally present in the atmosphere in concentrations of around 0.2 ppm and harmless in such low concentrations. CO is only harmful close to the emission source because only here are concentrations large enough to cause problems to humans. In elevated concentrations the gas causes dizziness and headache and at higher concentrations possibly death. CO bonds very effectively with the body’s hemoglobin Hemoglobin’s affinity for CO is 200 time greater than for O2, and thus the blood’s capacity to transport the necessary vital oxygen is dramatically reduced even at low concentrations. At concentrations above 750 ppm CO is lethal. The environmental effects of CO are not quantified although CO is suspected to play a minor role in global climate change. The CO formed during combustion does not oxidize significantly further into CO2. Instead CO can react with radicals in the air and in some circumstances react to form ground level ozone. Figure 44 – Emission rates for CO from diesel engines as function of engine load.